Serve these zesty spiral sandwiches at your next party. A great make-ahead appetizer. Simply slice right before serving. Combine cream cheese, cheddar cheese, chiles, green onions, bell pepper and olives in medium bowl. 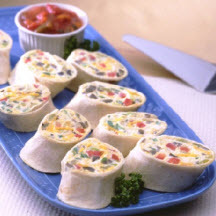 Spread 1/2 cup cheese mixture over each tortilla; roll up. Wrap each roll in plastic wrap; refrigerate for 1 hour. Remove plastic wrap; slice each roll into six 3/4-inch pieces. Serve with salsa for dipping.